New process supports the full workflow of coordinating with contractors and end customers. CDM has reduced the time required to perform quality assurance and control of its data by more than 50 percent. CDM achieved time savings by leveraging Esri commercial off-the-shelf tools. Camp Dresser & McKee Inc. (CDM), an Esri Business Partner, provides engineering, consulting, construction, and operations services worldwide. CDM clients include regional, state, and municipal governments and utilities; U.S. federal agencies; businesses and industries; and departments and ministries of governments around the globe. The firm comprises close to 4,000 employees. Esri's Data ReViewer application framework with customized CDM tests. CDM uses GIS for data management during the design and construction of water and wastewater utility networks, as well as for the long-term management of those networks. As a result, the firm has developed methodologies for designing a GIS to accurately represent real-world network conditions to meet the needs of its engineers. High-quality spatial data is therefore critical to support accurate engineering and management decisions for better design, construction, and management of the system over its lifetime. For all projects, CDM must integrate all spatial data available from the utility. This legacy data has often not been managed to ensure spatial and attribute quality or overall accuracy. Frequently, the data has duplicate geometries, invalid attribution, and spatial parameters that are not valid for the network. 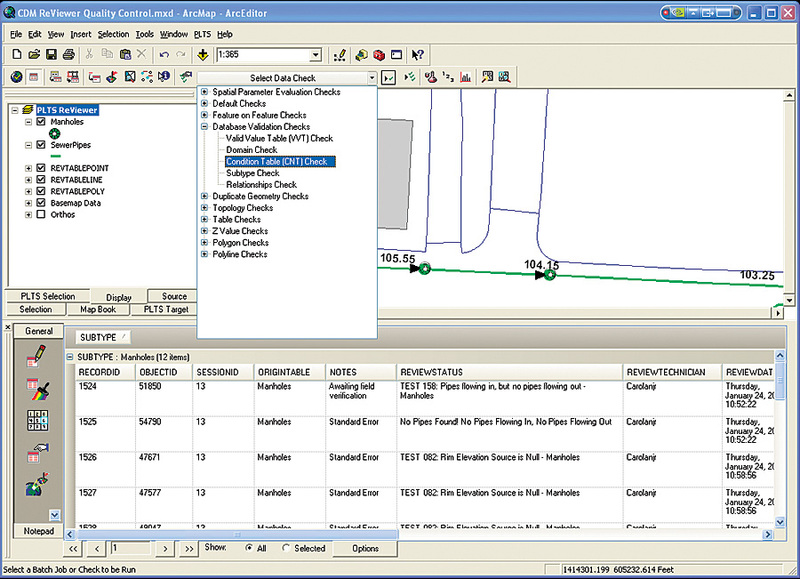 For example, CDM frequently encounters a requirement to exclude duplicate manhole covers within a specific tolerance. In addition to using legacy data, CDM must also compile its own datasets. Both the legacy and new data must adhere to common standards for feature type, attribution, pipe flow, and connectivity requirements to be useful. Integrating all the data and detecting and correcting errors are critical and often time-consuming tasks. In a typical scenario, CDM performs hydrologic modeling to ensure that all pipes are adhering to network flow requirements. In the case of a gravity-fed wastewater utility network, water must flow downhill based on the angle or slope of the pipe. CDM would rely on an exhaustive manual review of individual z-coordinate values to verify that each pipe and valve of a network adhered to this requirement. Designers would create checkplots and perform spot checks, as well as test hydrologic models, repeatedly. Once an error was found, it was captured by a CDM-developed application for later correction and documentation. This application did not support interacting with contractors and end customers to remediate errors. It also required manual rewrites to migrate it to the latest version of ArcGIS. CDM needed a solution to help it reduce the overhead required for integrating and managing data. After reviewing available options, including enhancing the in-house application, CDM selected Esri's GIS Data ReViewer because it provided a complete, commercial off-the-shelf (COTS) framework for performing quality assurance and quality control (QA/QC) work directly within ArcGIS. The extension provides CDM with close to 40 out-of-the-box quality control checks, as well as the ability to develop and apply hundreds of additional, customized quality control checks that may be required to validate utility network data. With this tool, CDM has succeeded in creating a streamlined QA/QC process on both simple and complex projects. 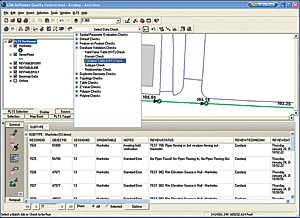 In addition to using the checks provided, the firm has used the open interface to develop a running library of more than 200 checks that are used throughout the GIS design and implementation of each project. 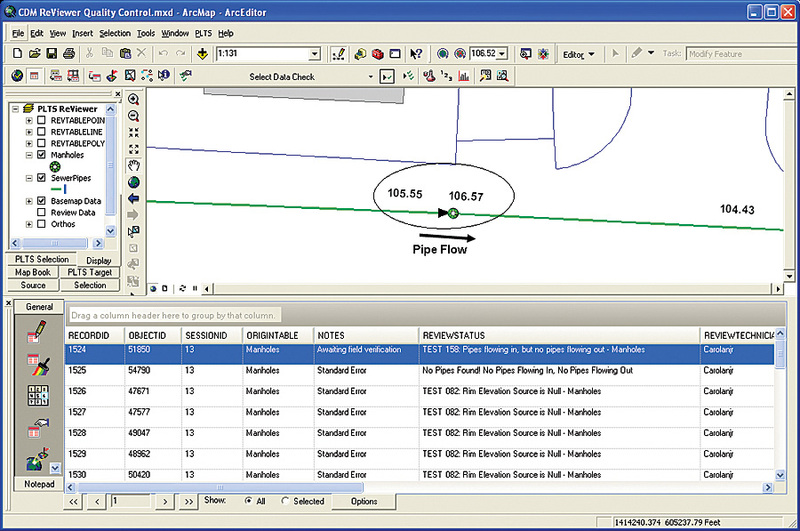 An example of an error identified between two pipe features. 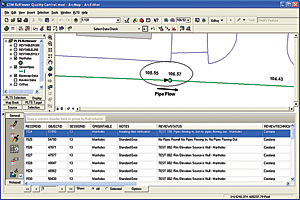 The upstream pipe feature should have a pipe invert elevation value greater than the downstream pipe feature. This new process allows the firm to coordinate data management with contractors and end customers. By leveraging an existing interactive error-correction framework to find database errors, CDM can communicate and track the correction of those errors with the entire project team, using an error table that documents the spatial extent and metadata for each erroneous feature. The new process and tools have reduced the time required to perform quality control of data by more than half for CDM. The resulting improvements in data quality, as well as the quality and efficiency of the utility design and construction, have led CDM to support the use of GIS Data ReViewer by its clients as a tool to help manage data maintenance over the life of the utility network. It has also become an important piece of technology at CDM to improve the efficiency and quality of work. James Carolan, a principal senior project manager with CDM, states, "By using these COTS tools, CDM was able to save significant time and money by leveraging the existing application framework and issue-tracking structure. We were able to concentrate our resources on developing unique and complex tests that run within the application framework, providing our staff across the country with a standardized and powerful set of quality control and assurance tools for less money than would have been required to develop an in-house application." Results for CDM have been improved project performance, reduced customer costs, and the availability of a framework for CDM and its clients to implement an ongoing quality control process to ensure the continued high quality of their data for the life of the utility infrastructure. For more information, contact James Carolan, principal senior project manager, CDM (e-mail: carolanjr@cdm.com, tel. : 617-452-6358, Web: www.cdm.com), or Dewey Marino, Esri (e-mail: dmarino@esri.com; tel. : 909-793-2853, ext. 1-1913).